Yeongjo (1694-1776, r. 1724-1776) was the twenty-first ruler of the Korean Joseon Dynasty. He was the second son of Sukjong ( 숙종; 肅宗), and succeeded his older brother Gyeongjong ( 경종; 景宗, the twentieth king). During his 52-year reign, Yeongjo accomplished a number of important reforms in various fields including political organization, culture, and industry. He put an end to the strong political factionalism which had dominated Joseon politics and had detrimental effects on state affairs. He reduced the military service tax by half, and ordered taxes on fisheries, salt, vessels, as well as by an additional land tax, to make up the difference in revenues. King Yeongjo also instituted an accounting system to rationalize state revenues and expenses. He adopted practical measures such as allowing taxes in remote Gyeongsang Province to be paid (in the form of grain) at nearby ports, and mountainous areas to pay in cotton or cash instead of grain. More coins were minted to encourage the circulation of currency. Yeongjo was a strong Confucianist, and Confucianism in the Joseon Dynasty reached its peak during his reign and the reign of his successor, Jeongjo. During the same period, Joseon experienced a vibrant economy fueled by the growth of trade, manufacturing and mining. One night, King Sukjong, the nineteenth monarch of the Joseon Dynasty, had a dream in which a priest came into his palace. The dream was so vivid that when he woke up, the king ordered one of his secretaries to go out of Namdaemun (the south gate of his castle) and see what was going on there. The secretary found a priest, the High Buddhist Teacher Yeongwonseonsa, taking a brief rest in front of the gate. The surprised king asked the Buddhist teacher to pray that he might have a son. Soon afterwards, his queen became pregnant, and the next year, 1694, she bore a son, Yeongjo. King Sukjong was very pleased and gave the Buddhist teacher an additional name, "Hyeoneung." At that time, Buddhist temples in Korea were heavily oppressed by the Confucians. Hyeoneung took advantage of his newly-found favor with the king and asked the king to enshrine his royal ancestral tablets in the Buddhist Pagyesa Temple. The strategy was successful. Hyeoneung's stele, sarira stupa, and King Yeongjo's royal robe are still kept in the temple. 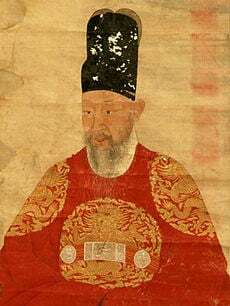 The second son of King Sukjong, King Yeongjo was appointed as the Crown Prince in 1721 and succeeded his elder brother Gyeongjong ( 경종; 景宗, the twentieth king), on the throne in 1724. King Yeongjo was a strongly Confucian monarch, and is said to have had a greater knowledge of the classics than his officials. During the reign of Yeongjo and his grandson Jeongjo( 정조; 正祖), Confucianism was dominant. The economic recovery from the wars of the late sixteenth and early seventeenth centuries was also at its height during Yeongjo’s reign. Trade and manufacturing flourished, and capital accumulated through the creation of monopolies and the wholesaling of goods. The existence of numerous small shops created a lively demand for wholesale goods. The government began issuing patents which gave artisans and manufacturers sole rights over the products they produced. Merchants along the rivers monopolized commodities from the provinces of Gyeonggi and Chungcheong. Merchants accompanied envoys to China in order to seek opportunities to trade, taking paper, horsehair and otter furs with them. The greater demand for silver and copper stimulated the growth of the mining industry. Wholesale activities created a larger demand for silver and copper, which in turn gave impetus to the mining industry. Many yangban became involved in commerce, farming, or money-lending to augment their incomes. During his 52-year reign, King Yeongjo achieved many reforms in various fields including political organization, culture, and industry. Realizing that the bitter rivalries between political factions had detrimental effects on state affairs, he attempted to end factionalism soon after ascending the throne. He practiced impartiality towards all political factions as a means of curbing factional strife. When he wanted to reinstate the universal military service tax, he left the palace and sought the opinions of officials, literati, soldiers, and peasants. He then reduced the military service tax by half, and ordered taxes on fisheries, salt, vessels, as well as by an additional land tax, to make up the difference in revenues. King Yeongjo also instituted an accounting system to rationalize state revenues and expenses. He adopted practical measures such as allowing taxes in remote Gyeongsang Province to be paid (in the form of grain) at nearby ports, and mountainous areas to pay in cotton or cash instead of grain. More coins were minted to encourage the circulation of currency. Yeongjo is also famous for having treasured Park Mun-su, who was appointed as Amhaeng-eosa (암행;어사) or secret governmental inspector. Park, who had earned great merit in putting down Yi In-ja's rebellion, traveled around Joseon exposing corrupt local officers and arresting them in the name of the king. Yeongjo was the first to take action against Roman Catholic activities in the country. By the eighteenth century, Catholicism was beginning to acquire a following, especially in the Gangwon and Hwanghae provinces. In 1758, Yeongjo officially outlawed Catholicism as an evil practice. Seven years after the death of Yeongjo’s eldest son, another son, prince Sadoseja (장조; 莊祖), was born to King Yeongjo. Immediately after his birth, the king decided to make the newborn Crown Prince. He distanced himself from his son, and placed him in the care of others in his court, in order to raise him as a future king. Consequently the relationship between King Yeonjo and his son was a difficult one. Sadoseja was in continual fear of his father, who frequently scolded him, and this apparently led to mental illness. Whenever King Yeongjo reproached him, Sadoseja randomly beat or killed people in the palace to relieve his stress, and was a sexual deviant. Yeonjo decided that his son must be put to death, but he refused to kill his son with his own hand, and Sado would not follow orders from his father to take his own life. On a hot August day in 1767, Sado finally obeyed his father and climbed into a large wooden rice chest. After eight days, Sado died of suffocation. Sado’s son, Jeongjo, was 11 years old when his father died, but his mother, Crown Princess Hong of Hyegyeonggung, taught her son not to hold a grudge against his grandfather. Nine years later, in 1776, Yeongjo died and Sado's son Jeongjo became king. Yeongjo was buried in the dynastic tombs at Donggureung. ↑ Daegu Zone Course, Daegu Metropolitan City. Retrieved November 11, 2007. ↑ King Yeongjo's Reforms, Korea History. Retrieved November 11, 2007. ↑ The Education of the Joseon Royal Household, donga.com. Retrieved November 11, 2007. ↑ Donggungilgi, Kyujanggak Institute for Korean Studies. Retrieved November 11, 2007. History of "Yeongjo of Joseon"
This page was last modified on 2 April 2008, at 19:21.